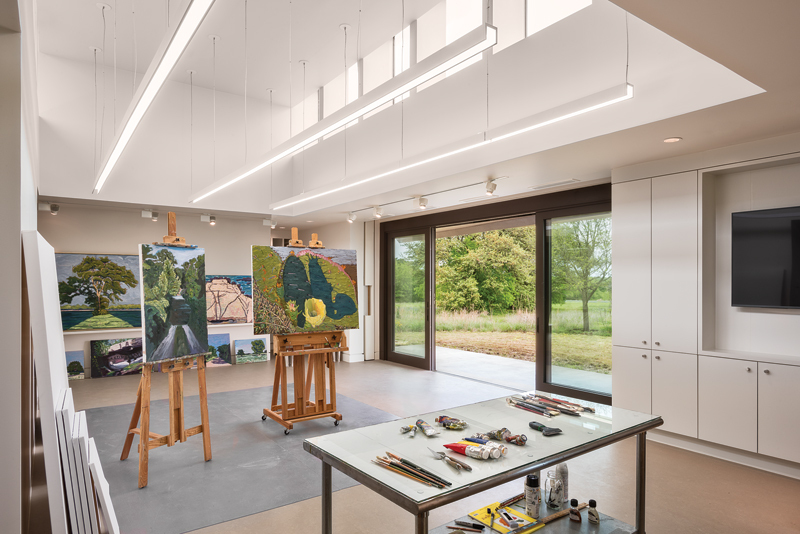 The studio’s south wall opens up, providing a view of the landscape. A wending walkway connects it to the main house. Photo by Peter Vitale. The studio’s south wall opens up, providing a view of the landscape. A wending walkway connects it to the main house. Photo by David Heymann, FAIA. Located near Crawford, the Prairie Chapel Ranch is the retreat of George W. and Laura Bush. For a period of eight years, it was popularly known as the Western White House. 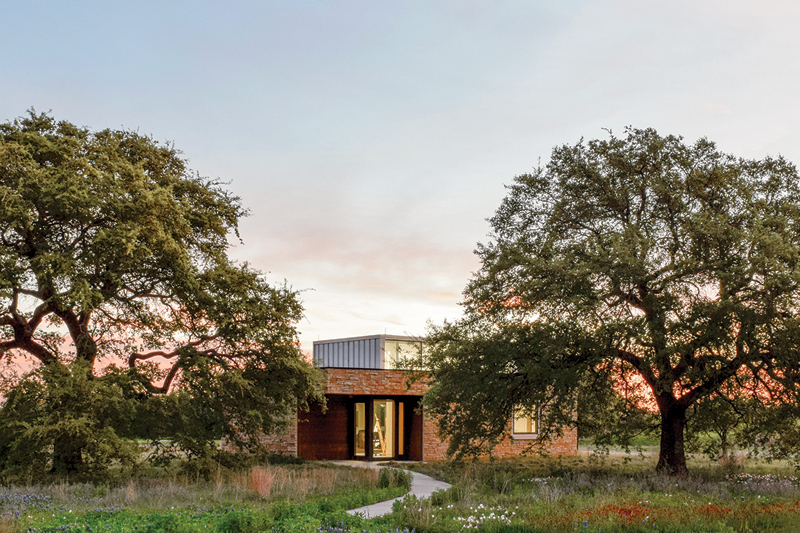 Architect and UT Austin professor David Heymann, FAIA, designed the ranch’s main building while W was running for president. The Bushes wanted it to be a discreet getaway, a place to recover from frenetic political life and spend time with friends and family. One story tall, clad in rough-cut Lueders limestone, and capped by a standing-seam metal roof, it is indeed unassuming. Russian leader Vladimir Putin evidently razzed Bush over the home’s modesty. But the structure’s sustainable design — which includes geothermal heating and cooling, rainwater collection, and passive solar measures — was cutting edge for its day, and its careful siting, gently curving plan, covered outdoor circulation scheme, and lack of an obvious main entry (every room in the house opens to the outside) present a lifestyle proposition that is something beyond the ordinary. After leaving office, W famously took up painting, and he recently hired Heymann to design an art studio for the property. Sited a stone’s throw from the main house, the new building is a clear relative of the existing structure — though with a tad more formal adventurousness. Clad in the same stone, it is topped by a light box with north- and south-facing baffled clerestory windows that fill the interior with diffuse daylight. An electrical lighting system replicates this quality of light at night. Heymann designed what he calls “little distractions” into the building: side windows that provide views back to the main house, so that W can walk over and see what’s going on. But when he’s in the painting area, underneath the light box, the artist can be utterly immersed in his work. And should he choose to paint from nature, the north wall slides away into pockets, and sliding glass and screen doors open up this section to a shaded patio and a sweeping view of the landscape. What a wonderful studio in a beautiful setting.